The hotel had a very good breakfast buffet with real hot food including eggs, bacon, sausage, waffles, hash browns, cereal, juice, coffee, and all the other things one might want for breakfast. I was very impressed. The two of us fill their plates and ate happily. We then continued our drive through Montana. There is no daytime speed limit on the Interstates, so we made very good time doing around 85 to 90 miles per hour when the roads allowed it. Though it was on and off rainy and sunny. For lunch after that big breakfast, we had hot dogs at a Town Pump gas stop just before turning off the Interstate to go to Yellowstone National Park. 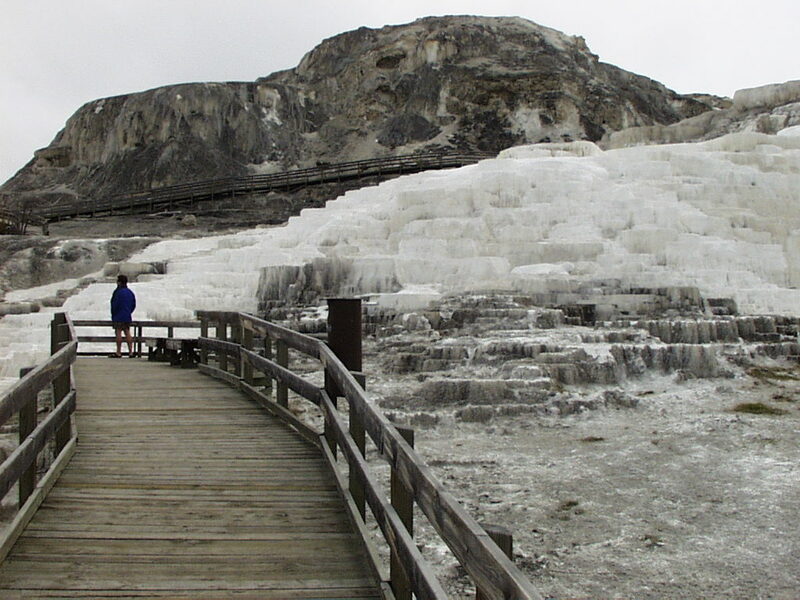 The only time I've ever been to Yellowstone was with my parents when I was a kid. I didn't really remember all that much about the park itself. Of all the things that I probably saw there, there were three things that actually remember. The first was composite all the hot springs that we probably saw; the second was a recurring memory of open grass areas where everyone would stop to watch either elk or bison graze on the profusion of grass; and the third was a somewhat disappointing memory of Old Faithful, where the geyser only did a little squirt at the foretold time. Or, that is what I remembered without the presence of the park to remind me. We entered through the northern entrance. And right at the entrance gate there was a small herd of bison with a few small young buffalo, still scraggly and weak from being born, grazing on the green grass at the entrance and being photographed by a dozen different tourists right before the gate into the park. The fees were more than I remembered, but justified by how much work the park still needs and then some. The very first thing we saw were the Minerva Terraces in the main complex of active and defunct terraced springs. The springs are mineral springs with hot water that comes to the surface and cools enough for the minerals to start precipitating out of the hot solution. So the minerals build terraces as the water runs over them. In the hot water bacteria grow in colorful profusion, reds, yellows, and even a few blues. Once the spring stops or gets diverted to another section by the slowly growing walls of minerals the water goes away and the bacteria dies. 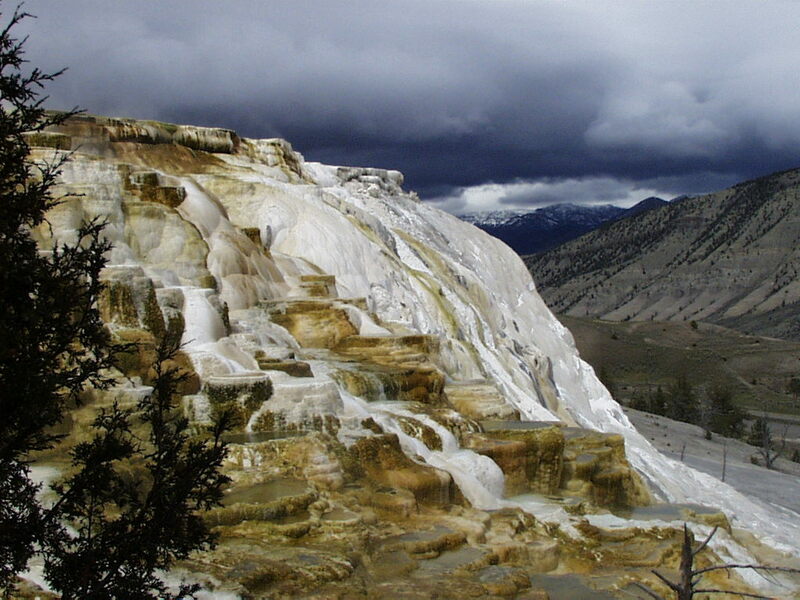 The bone dry terraces become dead white, and then, with time and wind the white terraces turn dirty. The complex of terraces had sections in all stages of development and decay. All were beautiful in their own way. One thing I remembered while doing the hike through all the terraces was that, as a child, we didn't actually walk through many of the features of the park. In part, I think it was because we were young and unable to do long distances; and in part, I think it was because we were there during midsummer, so the park was very crowded. Now, in the raw and early spring there was nearly no one. It made it very easy to go where we wanted to go, and there was no one to bump into, wait for, or be crowded by has we went through the park. I did most of the very windy driving through the park, and enjoyed the handling of the Passat as I did the steep, winding and narrow mountain roads. There were the open, grass areas that I remembered. There were also be stopped tourists on the road taking pictures, just as I remembered. There were, however, far more buffalo and elk grazing by the road than I remembered. I think in the still-cold weather the large animals were still in the valleys, avoiding the snow and walking the easier paths of roads. We headed south for Old Faithful. We skipped a couple of geothermal sites to get to the more famous geyser, as we thought we only had the day. When we arrived, it was snowing, lightly,but still snowing. John got out of the car with his shorts and sandals as well as his parka. I was just in leggings, sneakers, T-shirt and my rain proof, neon-green jacket. It was enough against the snow and cold that we could just stand there, watching the geyser, for a good 15 minutes. That's when I started to get cold and a man wandered by and asked us if we were waiting to see the geyser fountain. He was dressed in a hip-long parka with waterproof everything, and had his hood up against the falling snow. We said, yeah, we were waiting and he said that the Lodge had the times for the next predicted fountaining. So we walked with him towards the Old Faithful Lodge. As we walked, he pointed out to John that his parka had a hood and John replied that, yes, he knew that, but just didn't want to put it up. He was dripping with melted snow water by the time we got into the old Lodge, and his sunglasses were beaded, as were mine, by the fine mist. When we entered the old, wooden Lodge, I suddenly remembered quite a lot more than I had before. The Old Faithful Lodge was made by hand, of local wood, not all of it shaped. The railings were branches that were hand fitted together, and then finished to a high sheen. The floors of the old Lodge went up and up, a good four stories. I remember that when we arrived in mid-summer, the Lodge had been completely full and booked for months and that my mother had wanted to stay there. Since it was smelling and fairly late in the afternoon, I suddenly decided to ask John to ask at the front desk if there was a room available for us to stay the night. It can now that there was, and that it was in the new wing, which meant that the room actually had its own bathroom and shower. This was the luxury suite. So, we reserved the room, reserved a place in the dining room for the evening, and still had enough time to go up to watch Old Faithful do its thing. Old Faithful had a few surprises for me. This time, when we went out, there were at least a dozen people out in the lightly falling snow all turned towards the geyser. This time, the geyser splashed and fumed and then splashed some more a few minutes before sending a pillar of water and scheme up into the air nearly twenty feet tall. It was a billowing pillar of hot water, sending steam everywhere in the cold air, and went far higher than I ever expected it to go. I, and everyone around, was very impressed by the tremendous show. And, after the fountain had gradually splashed lower and lower to end in a plume of steam from the vent, the snow suddenly thickened and fell fast and dense. I think the steam had frozen turned to snow, but I'm not sure. It was quite the show. After that, we went back to the car and drove along way around to the Lodge parking lot. We then unloaded all our stuff and carried it to the room. It was a very nice room, overlooking a stream, and just a little bit further were about a dozen steam vents. Once inside the heated room, we took off all our wet clothes, turned on the radiator. I could hear the hot water running through the pipes and the metal fans in the room, and heat flowed off the metal in waves. I really enjoyed that, and hung up my wet coat, soaked socks, and damp shoes by the heater. We then went to dinner in the Lodge. It was all very cozy. The main room of the Lodge had a huge clock built into the side of the chimney for the four, huge, wood-burning fireplaces. Each fireplace was nearly ten feet long and at least five feet tall, and only one had a fire in it. We could imagine that all four were needed to heat the building when only wood heat was used. It was a huge, old sprawling building that had great character, and as we waited to get into the dining room, we just wandered about a bit looking. The pillars were all whole logs, unshaped and irregular, but they all still worked in their places. A hugs old burl hung out from one column and the wood was polished by all the hands that had touched it. The Dining Hall was of the same kind of construction, but built to be a formal dining area with chandeliers, wide picture windows, and all the tables were set with linen, crystal, and silver. It was casual dress, but the environment and settings would have been appropriate for tuxedoes and ball gowns. It was very nice. The staff was as new as their season, which was only a week old. The Lodge hadn't even been open until the last week, and folks from all over the country had come to work in the Lodge and around it. All the name tags had not only their names but their cities of origin. Our waiter was still learning some of the ropes, but we found out that he loved the ice fishing up in the mountains this time of year when I ordered the Rockie Mountain trout. The fillet had been lightly breaded, crisply fried and then doused with lemon and garlic, with crisp and firm vegetables on a rice pilaf. The rolls that came in the bread basket were fragrant with herbs. The salad left something to be desired, as it was mostly just lettuce. As a whole, the meal was good, but not absolutely excellent; however, given the distances all the food had to go in order to get into the park, it was very good indeed. Fortified with the warm meal and dry clothes we went out again to see the geyser at the predicted time that was close to 8:30. There were, again, about a dozen people out in the snow watching the plume of steam from the vent. This time, however, it did what I remembered from before. There was just a series of splashes, small steam vents, and there was a three foot spray of water. That was all. The folks that were out there ask some of the others if that was all there was to the geyser, and several of us answered that we had seen the twenty foot fountain from earlier. After standing out in the cold and steadily darker evening for an hour, we finally gave up to went back into the warmth of the Lodge. Again, we went back to the room, hung up our cold, wet clothes, and this time we went back to the lobby and found an espresso stand on the second floor. We each got a large hot chocolate. The three floors over the main floor of the lobby actually circled the center. They were all open to the lowest floor, and had railings that overlooked the huge fireplace. We flopped onto a couch next a one of those railings, and sipped our hot chocolate as we watched people wandered through the various floors and the lobby. That was really cool. All the railings were also of that unshaped wood. The ceiling was made from the hollowed out sides of logs laid very close together, providing insulation is well as a beautiful interior ceiling. It was very good to rest, just be in one place for a little while.